I am so excited for Fall this year! I feel like I anticipate it more than any other season (yes, even Summer), because there is so much to look forward to. I love that it’s the time of year we can bundle up, wear layers and fun patterns, and we really get to share our fashion sense more than any other time of the year. Every year it is so exciting to see what is trending; and this year I decided I was going to be on top of it! I spent a few hours scrolling on nordstrom.com a few weeks ago and found some of the best items for Fall that I know are going to be trendy, but even more important than that, they are easy to wear & pair together or with items you already have. Think of this as your go-to guide for some fun Fall staples to get you ready to look & feel your best. 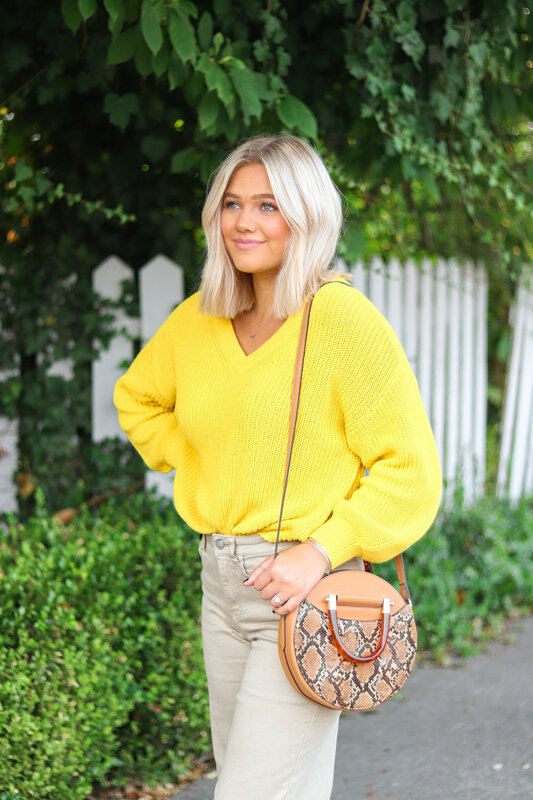 A few days ago I told you all that I even have a Pinterest page dedicated to all things yellow, so it would make sense that lately yellow is my most worn color! I love that it is vibrant and fun; and while a lot of blondes tend to shy away from it, I am obsessed. As we end the month of August and look toward September, of course I am already trying to think of ways to wear my favorite color! When I think of the colors of Fall I think about oranges, red, tan, and neutrals. Why not add yellow in the mix? When I came across this knit v-neck sweater at Nordstrom I knew it was going to be that perfect Fall staple to add to my wardrobe. 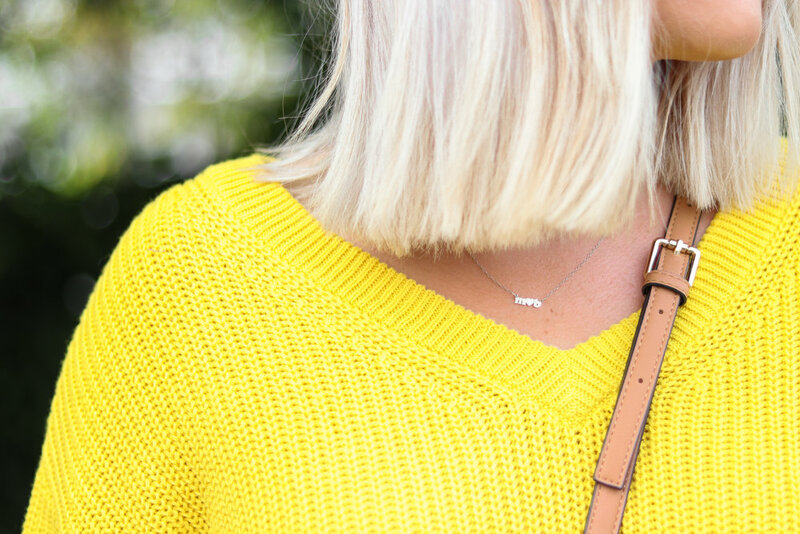 I love any slouchy sweater, and the fact that this one was a bold yellow was perfection. I like that the neckline is a subtle v-neck because you can wear it normal, or sort of off the shoulder (always trendy!). Sizing: I found that this specific sweater runs a little slouchier and is designed for a lose fit; am wearing a size small but could have got my typical medium if I wanted it more oversized. We’ve seen this flare trend coming back with a vengeance this year; from women preferring bell-bottoms over skinny jeans, to cropped wide-leg denim. Personally, I have always loved the look of khaki pants, but did not like that they made me feel like I was a 12 year old Girl Scout again haha! I found that it was difficult to make them look updated & trendy, until I found this perfect pair at Nordstrom. I love the high waist, especially since so many tops are cropped this season, it makes them really flattering. Since khaki looks great with both brown, black, or navy accessories, you are going to get so much wear out of these! For this outfit I have paired them with neutrals and brown accessories, but you could easier wear a black blouse and black & white tennis shoes for a sporty look. Sizing: I would say they run a little big; I am most always a 28 and sized down to a 27 in these specifically because they have a lot of stretch to them. I maybe could have even done a size 26, but prefer when things aren’t skintight. I am 5’ 5” for reference with length. They would be a perfect cropped style that hits well above the ankle on anyone taller than 5’ 5”. Okay, now that you’ve got your favorite sweater and pants, you need some fun accessories to showcase your style & amp up the look! I came across these platform shoes and thought they were the best blend of a bootie + a mule. I like that the slip on look is more casual; I can see myself wearing these with jeans and a t-shirt or making more fancy with a dress. I think that they are the perfect neutral shoe with this specific outfit, but also have a POP of interest with the snakeskin heel. Those 70’s vibes are making a big push for a comeback, and I am all for it. We saw snakeskin was really trendy a few years back, but look’s like it is back for Fall 2018. Bring on the snakeskin, faux fur, bold prints, yellow + oranges, and texture. I love that shoes can be such a huge focal point of an outfit, but at the same time you can rehear them more than any other clothing item. That’s why I always splurge on shoes; they are one item you can wear over & over and style so many ways! Maybe its just me, but I also tend to notice shoes first thing when I see an outfit. These particular mules are super comfortable and soft, but I also love that they give me some height! Okay now for the real focal point of this outfit.. this gorgeous bag! At just under $50 it’s such a great addition to your Fall wardrobe. The perfect blend of style with a trendy touch, but also classy enough to wear over & over again. I love TopShop because they are always on trend and so creative with their clothing and accessories, but are affordable as well. I like the adjustable straps and found that there is actually a lot of room in the bag; perfect for holding my lipstick, phone, wallet, and sunglasses. I have linked my fave new sunglasses below! I always find the best sunglasses in the B.P Department at Nordstrom because they have a huge selection, mostly under $20. This complete look is one of my favorites ever; I love that it is confident and bold, but also trendy and I feel like my personal style really shines through. I hope this guide helps you find some of your new favorites, and can act as an outline for what’s trending for Fall. If this look is out of your comfort zone, try adding one fun piece at a time into your wardrobe. 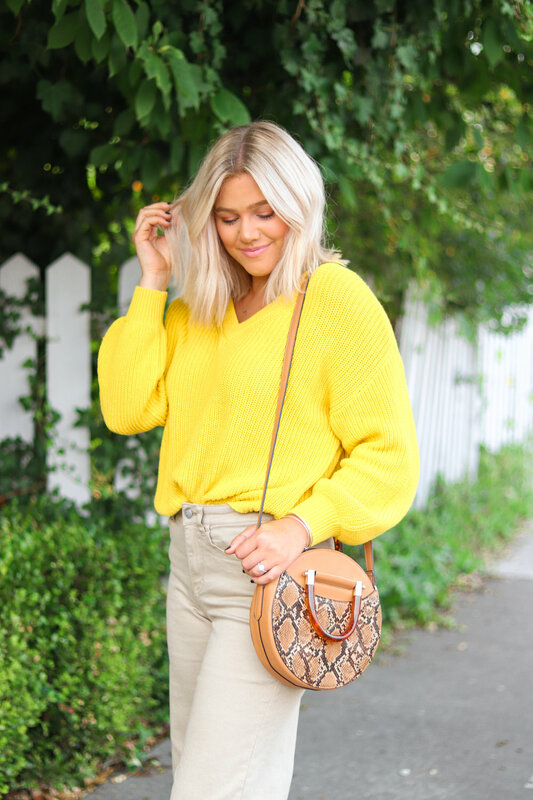 Whether it’s a bold pattern, a great shoe that will go with tons of outfits, a comfy sweater in a color you've never worn, or a style of pants that pushed you out of your comfort zone, try something new! I love that fashion always lets us push our boundaries and try new things. I would love to get some inspiration from YOU too! Huge thanks to Nordstrom on partering with me for this post! As always, all opinions and styling are my own.